Med Anette Guldbrandsen (bilde) i front, er The Sabbathian snart klare med nytt album. Release på 'Latum Alterum' er satt til 25. januar, via Svart Records. Formater er cd (inkluderer ep-en fra 2014) og lp, og digitalt. "The words highly anticipated come quickly to mind when talking of the US-Norwegian project The Sabbathian and the chance that there will be new material from them. 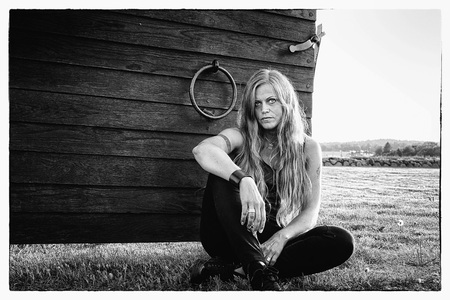 The band, formed by Chad Davis (Hour of 13 and many more) and Anette Uvaas Guldbrandsen (Nàttsòl), released their debut EP, Ritual Rites, on Svart Records in 2014. The duo's personal approach to old-school doom won over many metal hearts, and the wait for new material is over in January 2019." Vi får vite at albumet er betydelig mørkere enn den foregående ep-en, og at musikken beveger seg mer mot Candlemass og Bathory. I presseskrivet sier Anette at "...the overall theme can be described as slightly morbid, as it is very much about passing over to the other side - latum alterum. The odd one out is the song Embrace The Dark, which retains the sound of the EP. The intro and outro tracks are meant as a way of blessing the souls on their journey." Liv Kristine, kjent fra Leaves Eyes, er gjest på en låt. Det er snart klart for første smakebit, jeg prøver å oppdatere når denne foreligger.